Madeleine McCann returns to the fore with news that Gonçalo Amaral, the “poisonous, grazing, shambles” ex-copper, has made money from her story. 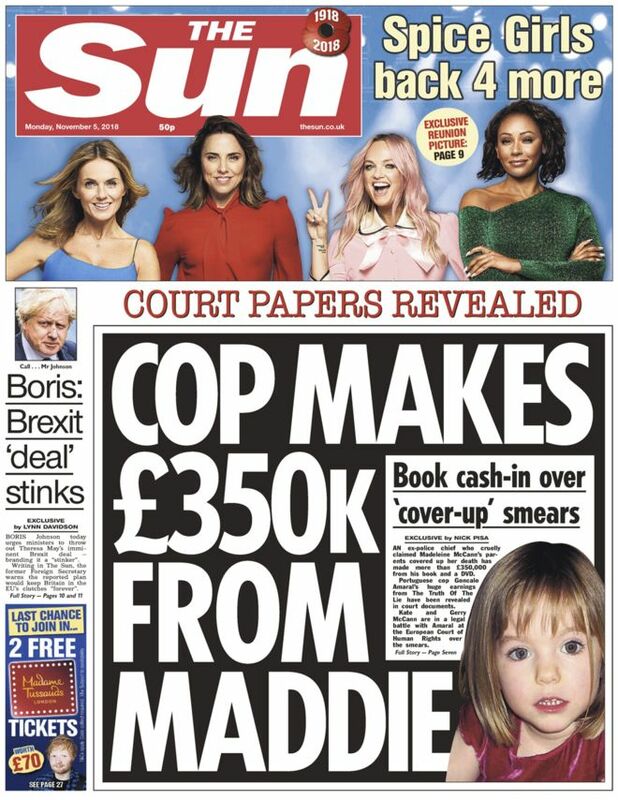 How much the Sun has made from ‘Our Maddie’ stories is not calculated, but the missing child is on the paper’s front-page once more so her face must shift copies. Amaral has apparently made £350,000 from his book, the Truth of the Lie, and a DVD. This, says the paper, is a “fortune” – the kind of money that buys a studio flat in a decent bit of London. On page 7, we spot the McCanns, Kate and Gerry. The Sun says they’re challenging the Amaral decision at the European Court of Human Rights (ECHR). They are taking on the Portuguese State not Amaral, as the Portuguese Resident website notes. The McCanns won a libel case against Amaral’s book but saw the decision reversed on appeal – a move supported by Portugal’s Supreme Court. Contesting that ruling at the ECHR is, says the Sun, the McCann’s “final effort to avoid paying £750,000 compensation to the man who cruelly claimed Maddie’s parents covered up her death” in May 2007. The McCanns deny any part in their daughter’s disappearance. A third of those who have won against Britain at the European Court of Human Rights are terrorists, prisoners or criminals, figures show.Among claimants the court found in favour of since 1975 are murderers, terrorists in Iraq and IRA gunmen. It [the figures] is a response to criticisms of the Strasbourg court by Tory ministers and The Sun… Commons Justice Committee chairman Bob Neill MP said: “This is well beyond what any sensible person would say is real human rights. It’s mission creep, law made by judges who are not judges and many from countries with questionable human rights and very little judicial experience.” – “European Court of Killers’ Rights”, the Sun 2016. Grayling said last week the ECHR did not “make this country a better place”. David Cameron has said the court risks becoming a glorified “small claims court” buried under a mountain of “trivial” claims , and suggested Britain could withdraw from the convention to “keep our country safe”. An unnamed source tells the Sun: “Kate and Gerry have full confidence the European Court of Human Rights will find in their favour. It hasn’t altered their determination to carry on searching for their daughter.” Best of luck. The Sun seems to doubt the court’s trustworthiness. The paper says it could be an 8-year wait for the case to be heard. The Express says the cost could be “astronomical”. If you have evidence about the search for the missing child contact the police. Or you could call Amaral – the Sun says he might be planning a sequel. Meanwhile… a child is missing.